Once Bonfire Night is out of the way Manchester is all about the countdown to Christmas and the Christmas Markets. Early November sees the famous giant Santa take up his festive home watching over Albert Square from the roof of Manchester Town Hall. Followed shortly afterwards by the official Christmas lights switch on. Then the christmas shopping begins! From there it’s just a few days before the Manchester Christmas Markets arrive. Since starting in St Ann’s Square 16 years ago the Christmas Market has grown into one of the busiest in the whole of Europe. Last year it saw almost 10 million visitors with over 100,000 on the opening weekend and this year looks to be busier still. It’s grown in size each year too and now stretches to seven locations around the city with new sites at Market Street and Cathedral Gardens joining the likes of King Street, Exchange Square and old favourite Albert Square. While mulled wine is readily available all over, each area has something a little different to offer. Albert Square is home to the main market, in the heart of the city with the giant Santa looking down. 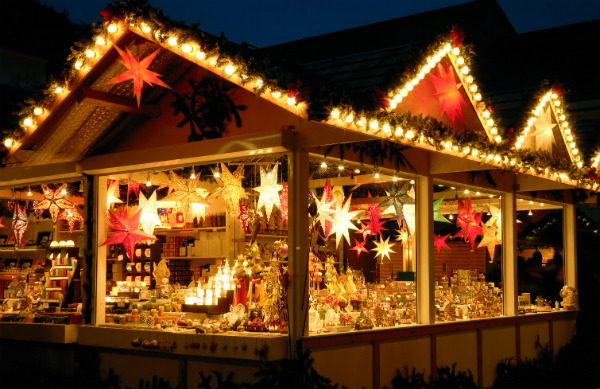 It’s filled with traditional wooden chalets selling a range of crafts and gifts - everything from glassware to handmade wooden toys, strawberry vodka to damson beer - and of course food traders. Over at St Ann’s Square - where the markets began - it’s a traditional Bavarian affair. With German beer, bratwurst, schnitzels and strudels available to enjoy on the day along with German sausages, chocolate and Christmas decorations to take home for gifts (or to treat yourself). The King Street Market is even more multicultural. Featuring a bar serving French wine and beer and stalls selling a variety of food from French crêpes and waffles to Greek honey and Italian cheeses. 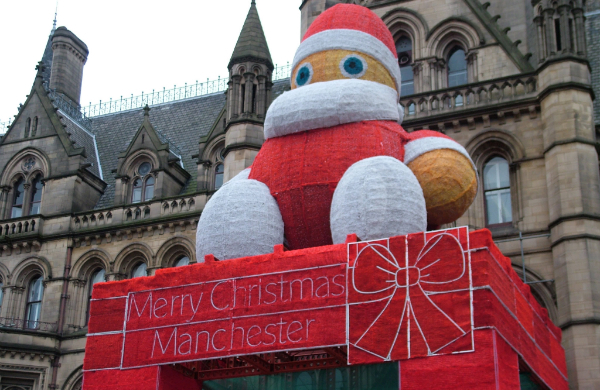 However, as big and popular as they may be, the Christmas Markets aren’t the only Festive fun to be had in Manchester. 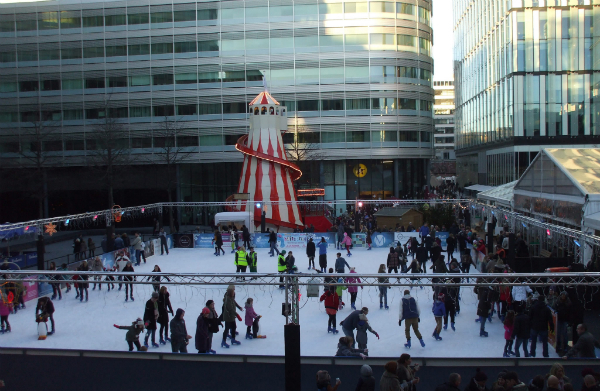 For family fun or perhaps a romantic date there are ice skating rinks at Spinningfields and Media City. Both areas have bars serving winter warmers including mulled wine and hot chocolate. The bar at Media City – The Lodge – includes a classic German Bierkeller while Spinningfields’ The Lawn Club has been converted from its previous summery guise to a cosy ski lodge, serving Christmas cocktails by open fires. Elsewhere in Spinningfields the Curious Teepee returns to The Oast House. The huge popup tents are filled with fairy lights and sheepskin throws. Turkey roasts and hog dinners are available as well as festive drinks. For parents of small children, Santa can be found in various Grottos’ around the city including at the Manchester Arndale, The Trafford Centre and Chill Factore. There really is something to help everybody in Manchester get into the Christmas spirit, from now right up until the big day.